In some instances, original viewpoints turned out to be difficult to match and the solution was to move towards slightly altered positions or to take an altogether new line of sight on the subject in hand. It was also clear that certain scenes in Views of Brora & District could be replaced by images of more relevance to the history of the village(an early view from the top of the Memorial Clock Tower, for instance, along with those of the coal mine and brick works in their riverside locations. Such photographs were found elsewhere or provided by individuals with good local knowledge. Sinclair's intriguing record of the evolving townscape, therefore, provided a core inspiration rather than the definitive source for this new album. Though the original book and its images are undated, a chronology could sometimes be estimated by the established dates of certain events. The commemoration of the Memorial Clock Tower in 1922, is an example, as is the destruction by fire of two village hotels in 1910 and 1924. The presence or absence of such buildings provided at least a date-range for some of the early photographs. 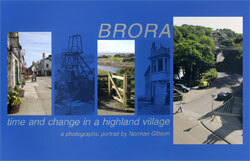 Brora's history is well documented elsewhere and so, like Sinclair's publication, this is primarily a pictorial record. It sets out to make available once again the black and white images of the past while simultaneously offering(especially to the future(the colour photographs of the present. Brora: Time and Change in a Highland village started out as an essentially simple photographic quest, namely, to take the imagery of the past as a starting point and explore visible changes over the previous hundred years or so. As the project continued, however, the author began to have a clear sense that Sinclair's monochrome album was addressed(however subconsciously(to the future: it was a gift to a future that became our present in the early 21st century. It seemed appropriate, therefore, to extend the new collection beyond the pairs of then-and-now and, with some further images from today, salute the generations that will follow our own. The final colour pages, therefore, widen the pictorial scope and offer additional views of the village and its surrounding terrain. In some of the landscapes, subtle archaeological traces remind us of our remote past(fleeting signals from the earliest minds that shaped Brora's multi-layered history and heritage.